Minke is a super-strong vessel for cruising to remote locations, built to sail easily through heavy weather and to be very comfortable upon arrival at any destination, whether it be an isolated anchorage or marina berth. Key attributes of the boat include (1) an extremely rugged "no-maintenance" aluminium hull, (2) a fabulous pilothouse with 360-degree views, (3) robust twin keels that enable routine beaching fully upright ("drying out") for total independence in remote locations, (4) voluminous tankage for long-range operation and prolonged periods far "off the grid, " and (5) comforts of home, such as a convenient galley, shower room with ample hot water, automatic fresh-water toilet and cosy cabins, making for a delightful home away from home or long-term liveaboard. This is a strong vessel for sailors who know what is required to achieve maximum utility and safety while also being comfortable in real-world conditions. Now comfortably berthed near Honolulu in Hawaii's safest marina, she is ready to continue cruising, whether toward Alaska or into the wonderful South Pacific. It is akin to a floating country cottage with modern amenities, including fabulous 360- degree views, an attractive and functional galley and lounge, cosy sleeping areas and modern amenities, such as a freshwater flushing toilet (in the forward head). Minke has a fantastic pilothouse, two comfortable cabins, two heads, a separate shower room and generous closet space. If you want to see the world in comfort, you will love Minke's pilothouse as much as we do. The forward cabin has a large v-berth for two large adults, as well as two bunks, and the aft cabin has a double bunk. Each cabin has its own head/toilet and sink, good lighting, both DC and AC outlets, ventilation fan, huge overhead hatch to watch the stars and/or feel the breeze, closet and additional storage space. The galley is fully equipped with stove (including oven), microwave oven, sink with pressurized hot and cold fresh water, a seawater hand pump for washing dishes at sea (to conserve fresh water), refrigerator and separate freezer (with another large freezer in the forward cabin), pots and pans, cutlery and kitchen gadgets, and enormous amounts of storage space. The lounge area has seating for about five adults at the table, with room for more at the helm station and nav/comm station. -Shower cabin: stand-up or sit-down shower with mahogany seats (new March 2018), shower tap (new March 2018) and dedicated shower sump bilge pump and float switch, plus large area for sitting or standing outside shower to towel off, get dressed, etc. Dedicated deck vent to the shower cabin. Shower sump was given multiple layers of epoxy followed by several layers of Bilgecoat in March 2018. Shower cabin has large hooks for hanging foul-weather gear at sea. -Forward head toilet: ShurFlo Aqua kind automatic fresh-water toilet with vacuum system and holding tank. Waste can be directed overboard or to holding tank. Holding tank can be emptied overboard using built-in electric pump or via deck pump out. -Aft head toilet: Jabsco seawater toilet with full-size seat. Toilet, all hoses and connections new March 2018. Overboard pump out. This is the toilet of choice for long-range cruising (because it uses none of the boat's fresh water). Galley accessories: pots, pans, skillets, strainers, food-storage containers, cutlery (forks, knives, spoons), measuring cups and spoons, can opener, etc. Minke's biggest safety feature is the boat itself: the massively constructed aluminum hull, keels and skeg are the first line of defense to keep the crew safe. Indeed, when crews of typical sailboats are likely to face troubles, the crew of Minke is likely to shrug and carry on, and even have fun. Best of all, having such a strong boat gives everyone aboard, not least the skipper, peace of mind, thereby enabling everyone to worry less and enjoy cruising more. In addition to this built-in safety, Minke is well stocked with safety equipment - the sorts of things that are costly to obtain but will likely never be used. 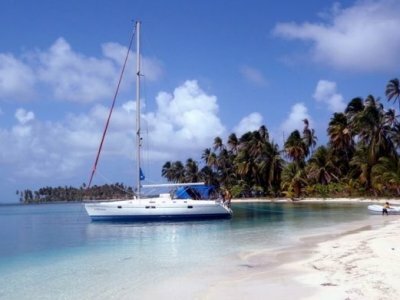 fitted with both DC and AC systems for maximum utility and convenience at sea and while berthed. Wiring is marine grade, with wire runs that are easily accessible (a priceless asset that experienced sailors will appreciate). 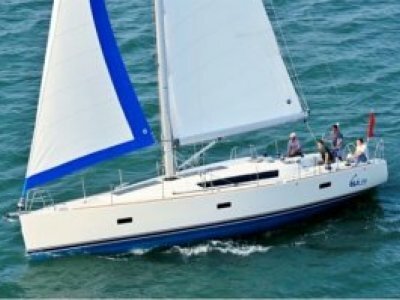 Battery capacity is very substantial, allowing sailing for a full week between charges (assuming use of all navigation systems at night, radar off during the day, and continuous use of the fridge). Charging is via engine, shore power, generator and/or solar panels. Exterior lighting includes new bright LED nav lights and a new mast-top tricolor. The pilothouse and cabins have outlets for both shore and inverter power, and they are fitted with generous lighting and fans. -Fans: Caframo fans, one each in forward and aft cabins, two in pilothouse house, one in engine room (all newly installed in March 2018) Electronics: navigation and communication. Navigation and communication equipment includes autopilot, chart plotter, depth sounder, electronic wind indicator, VHF, AIS-B and new radar, as well as a marine-grade stereo system, among other things. Systems are intentionally independent for redundancy, and there are multiple sources for obtaining GPS position. All systems are in excellent working order, with a number of key components newly installed in 2017 and 2018. Bermuda rig with single aluminium mast, forestay, double backstays, double lower shrouds, single upper shrouds and single spreaders. Both mainsail and jib are on Harken furlers, enabling easy single-handed sailing. 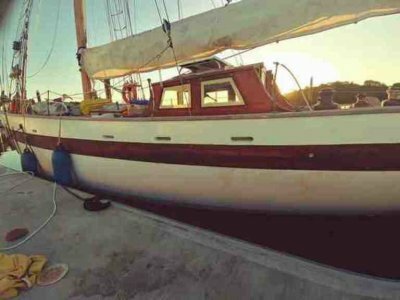 The mainsail and jib (new 2018) are in outstanding condition. The mast has welded steps to enable easy access from deck level all the way to the top of the mast. 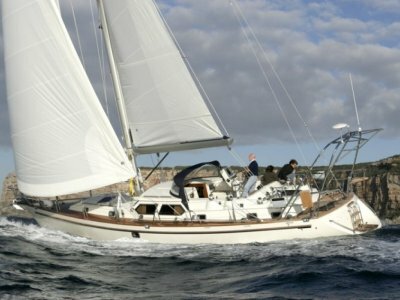 Minke sails very well indeed, especially in winds over 12 knots, with regular daily runs of 140 miles on ocean passages. 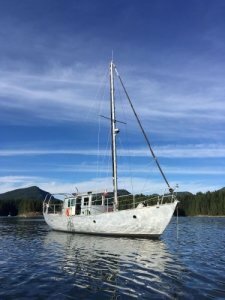 Minke was professionally constructed in Courteney, British Columbia, by Ken Splett (who built many aluminium and steel boats with similar hulls) based on a design by Jack Carson. The hull, deck, pilothouse, frames are constructed of marine 5086 aluminium. The hull is unusually thick for a boat of this size - 3/8" - making for an especially strong vessel. The pilothouse includes integral welded window frames, giving it incredible rigidity. Massively constructed twin keels and skeg enable the boat to be beached almost anywhere while giving it excellent tracking ability under sail. The interior of the hull is coated with spray foam down to the bilges, providing full insulation from condensation and noise. Interior woodwork, by Tony Lyons and other shipwrights, is crafted from marine gum wood and marine plywood using marine-grade fasteners and fittings. -Deck hardware: welded mounts and chain plates (no holes in deck except for wiring from the mast); very strongly fabricated deck bollards forward and aft (these extend through the deck and are welded to the hull for extreme strength); welded mast tabernacle; welded deck lockers aft; welded bow pulpit, guardrails and stanchions; welded Bimini frame. oExtensive supply of engine and hydraulic spares, including filters, belts, hoses, fluids, etc. -Replaced most hoses: water, fuel, drains, toilet, etc.